Shopping for Nosferatu Action Figures? An Entertainment Earth Exclusive! Count Orlok comes complete with eerie green glow. 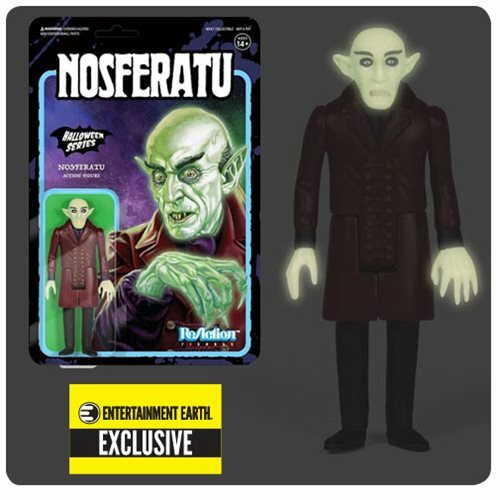 The Nosferatu Glow in the Dark ReAction Figure - Entertainment Earth Exclusive takes his inspiration from years gone by, bringing the famous monster to "life" as a 3 3/4-inch scale action figure - but with an evil aura. Packaged on a retro 6-inch x 9-inch cardback, classic figure collectors can't miss this awesome figure! Ages 14 and up.